I’ll be the first to admit that over the past two weeks, I have been drawn to come back again and again to the Banana Republic outlet store at the nearby mall.Â The gorgeous tops and dresses they had sure played a big role in influencing my decision, and it was also all those signs outside screaming 40% off and 50% off! 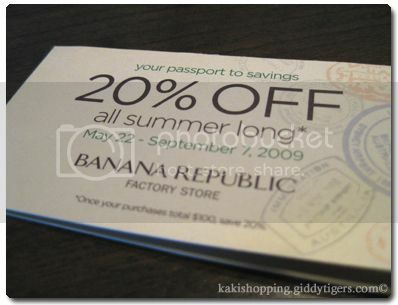 It is such an ingenious idea to get people to come back again to the store.Â Â With this card, every purchase of $25 entitles the holder to a chop.Â Collect 4 chops and you get 20% off your future purchase.Â So if a particular item is on 40% discount, with this card,Â you’ll get 40% + 20% (plus more chops on the card ifÂ our purchase is more than $25)!!! 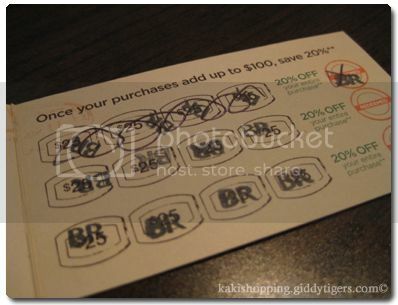 I redeemed the first 20%, but I still have 2 more 20% offers unredeemed. Is it any wonder why I’ll miss the shopping here?